バッカーノ！ / （中文名欠奉） / Baccano! I enjoy Potemayo. Sure it’s senseless and sells itself largely on the two little alien/extra-dimensional being acting cute, and the jokes can be seen a mile away, but if you switch off your brain and simply let it flow over you it’s not a bad way to waste 30 minutes. Much like Hare Guu or Azumanga Daioh, you’d have better luck finding the abominable snowman than any shreds of plot here, but that doesn’t make it any less enjoyable. Other than that, Mushi Uta, Sayonara Zetsubo Sensei and Zero no Tsukaima are probably the shows that I derive the most enjoyment from. 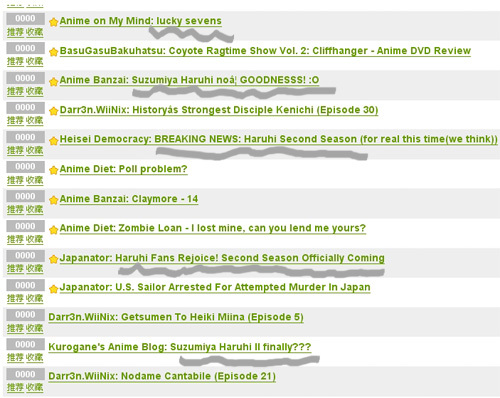 ZnT seems to already be suffering from a pacing problem similar to the first season though. And I absolutely agree with you – the draw card of Darker than Black is its characterisation. Episode 13 and 14 are some of the best anime I’ve seen, and I can see myself going back to watch them again and again in the coming years. Did the likes of Potemayo show a cultural difference ? It seems the western anime community showed great love for it(so far), meanwhile not so much hype generated within eastern otaku society(geographically, compared to US). always a good starting point in the hunt for seasonal hypes in Japan.